Carson Wentz wasted little time finding his footing in his season debut. Wentz made his first appearance in a game since tearing two ligaments in his left knee last Dec. 10 and led the Eagles to a touchdown on his first possession. There were plenty of twists and turns after that, but in the end, Wentz's return was a success as the Eagles turned back the Indianapolis Colts 20-16 on Sunday at rain-soaked Lincoln Financial Field. 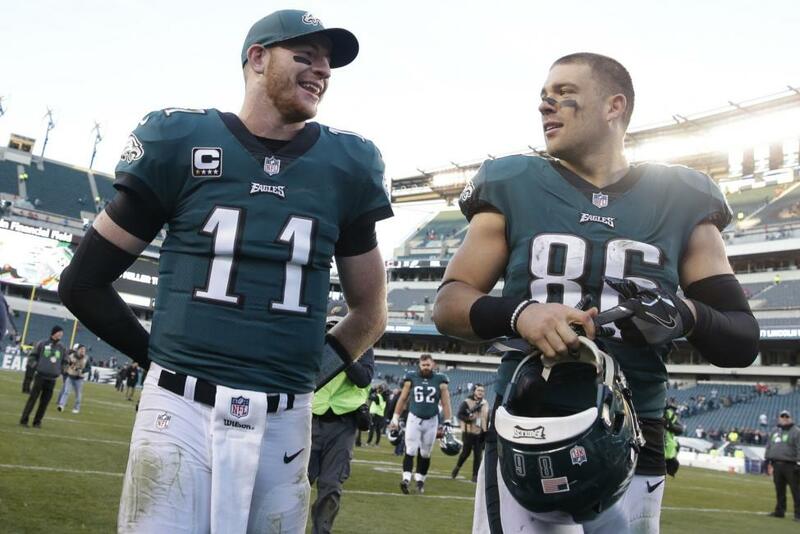 "It felt good to finally be out there," Wentz said. "It was a long time coming obviously, a lot of excitement, a lot of emotions, but coming out way we did with that hot start going right down the field, going some no huddle, tempo, it felt good." Wentz finished 25-of-37 passing for 255 yards. "Emotions were running high from the moment I woke up this morning," he said, "but for me, I was just putting on worship music and getting in the zone like that, and it just felt like another game at the end of the day." The first touchdown came on a 13-yard strike to rookie tight end Dallas Goedert, who was targeted seven times and made seven catches for 73 yards, all career highs. The Eagles led 7-0 halfway through the first quarter. Wentz survived five sacks on his reconstructed knee. He said he didn't think about the knee once while playing and it felt good to absorb his first hit. The Eagles' win spoiled the return of former offensive coordinator Frank Reich, who helped lead the Eagles to a Super Bowl title in February and is now the head coach in Indianapolis. "There were a couple of times I knew that (Wentz) was checking things and I knew what he was checking, but the thing is, if you say something, he's going to check out of that," Reich said. "You don't get into playing that game, just play football." The win wasn't secured until the Eagles' defense came with four stops after the Colts reached the Philadelphia 11-yard line for a first down with 1:35 left. The big play in that sequence came on fourth-and-3 at the 4-yard line, when defensive end Derek Barnett was able to trip up Andrew Luck and bring him down for a 16-yard sack. It looked like Luck was going to keep his balance as he stumbled to his right, but eventually fell down, then pounded the ball into the turf. "I need to do a better job of wrapping him up," said Barnett, a second-year rusher who broke Reggie White's sack record while at the University of Tennessee. "He's a big quarterback, but we have to be smart with the rules and everything. It was a big stop that we needed. It was just us executing on defense." The Colts got the ball back one final time, but the possession began at their own 11 with 43 seconds left and no timeouts. They brought Jacoby Brissett in to throw a Hail Mary pass after the drive reached the Colts' 46, but the pass fell to the ground. The Eagles' defense came up big all day. Wentz turned the ball over twice in the third quarter -- on an interception and a fumble -- and both turnovers gave the Colts the ball inside their red zone. But Indy could not cash those miscues into points and had to settle for Adam Vinatieri field goals from 31 and 28 yards. "Playing at home we have the crowd behind us, and that's one of the big reasons for the (red-zone) stops," Eagles linebacker Nigel Bradham said. "It gets loud when they get down there inside that red zone, it kind of caves in on their quarterback, and you can see the communication problems they have." A 28-yard field goal by Adam Viniatieri the Colts a 16-13 lead just 40 seconds into the fourth quarter. "We were up 16-13," said Colts linebacker Anthony Walker, who had the interception of Wentz. "We have to be able to finish that." Luck finished 25 of 40 for just 164 yards. Indy's run game mustered just 68 yards. The Eagles dominated this one statistically, holding the ball for 40 minutes, 20 seconds to the Colts' 19:40. The Eagles also outgained the Colts 379-209, collecting 26 first downs to 14 for the Colts. The Eagles took a 20-16 lead with a mammoth drive consuming 11 minutes, 18 seconds to travel 75 yards, getting a 4-yard touchdown run from the seldom-used Wendell Smallwood to cap series with 3:02 to play. It was his first touchdown since Oct. 1 of last year when he scored against the Los Angeles Chargers. The third-year running back, pressed into action with the Eagles' Jay Ajayi and Darren Sproles sitting out with injury, had 56 yards on 10 carries. Smallwood also had a 34-yard reception that led to a Jake Elliott 33-yard field goal that gave the Eagles a 10-7 lead in the first half. Corey Clement also rushed for 56 yards on 16 carries. The Eagles rushed for 152 yards, with Josh Adams, in his first NFL game, gaining 30 yards on six attempts. "It felt great to be out there," Smallwood said. "I felt like I had a good week of practice and showed I could handle the stuff that (the coaches) gave me." The winning drive was a penalty-filled one. At one point, the Eagles faced a second-and-26 after a hold on Clement and a 10-yard sack. But the Colts bailed the Eagles out with a defensive holding call. Another defensive holding call also aided the drive. It looked like the Colts stopped the Eagles fter a pass fell short on fourth-and-5 from the Indianapolis 42, but a penalty gave the Eagles a first down with 6:19 to go. The Eagles were penalized 10 times for 110 yards, with 55 of those yards coming on two pass interference calls against cornerback Jalen Mills. The Colts were penalized 11 times for 77 yards.